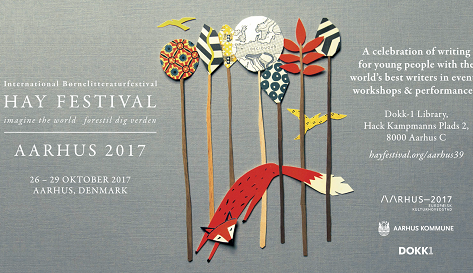 Hay Festival has announced the full programme for the inaugural International Children’s Literature Hay Festival Aarhus 2017 taking place in Denmark (26 – 29 October) in collaboration with European Capital of Culture Aarhus 2017. Free to attend, and with events in French, English, Danish and Spanish, the festival will be a global celebration of writing for young people – the first Hay Festival exclusively for writers of children’s and young adult literature. Talks, workshops and performances will offer a memorable look at the world of books for young people, parents and teachers, with leading writers and illustrators from around the world: Cressida Cowell, Meg Rosoff, Chris Riddell, Oliver Jeffers, Eoin Colfer, Anna Woltz, Arne Svingen, Kim Fupz Aakeson, Endre Lund Eriksen, Stian Hole, Jan Blake, Janne Teller, and the Aarhus 39 selection of Europe’s best new writers, featuring Ævar Þór Benediktsson, Ana Pessoa, B. R. Collins, Katherine Rundell, Katherine Woodfine, Laura Dockrill, Maria Turtschaninoff, Sandrine Kao and Sarah Crossan. The festival will take place in Dokk1 public library – one of Aarhus’ exciting new development projects and winner of the best library of 2016. Tickets can be booked online now.